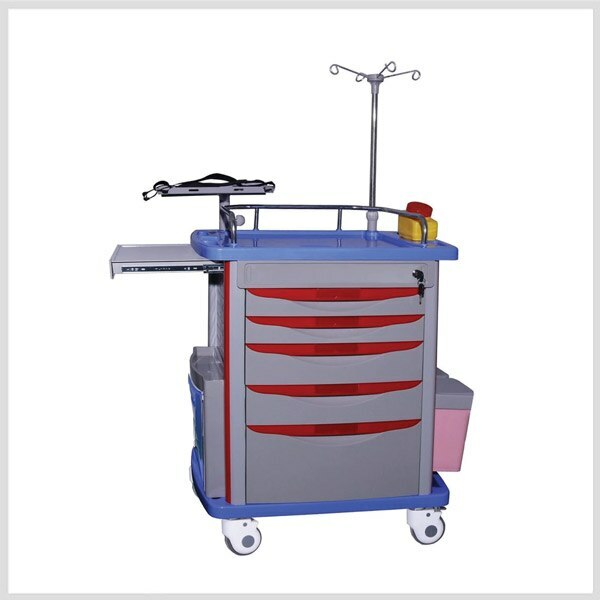 Emergency Trolley / Crash Cart (SoClean) Make: So Clean High quality ABS Body with raised edge design. Stainless Steel Guard Rail. High quality Scratch-proof Aluminum Columns for extra strength. 5 Drawers with Flexible & adjustable I nner partitions. – 2 Small Drawers – 2 Midsize Drawers – 1 Big Drawer – Label card holders on drawers 1 Defibrillator Shelf & 1 Extra Sliding Side Shelf. 1 CPR Board, Oxygen Cylinder Holder. 1 IV Pole, 1 Utility Container, 1 Sharp Container, 2 Dust Bins. Power Outlet & Hooks. Four Noiseless Castors (Front Two with Brakes).